For the first time, astronomers have detected the presence of complex organic molecules, the building blocks of life, in a protoplanetary disk surrounding a young star, indicating that the conditions that spawned our Earth and Sun are not unique in the universe. This discovery, made with the Atacama Large Millimeter/submillimeter Array (ALMA), reveals that the protoplanetary disk surrounding the million-year-old star MWC 480 is brimming with methyl cyanide (CH3CN), a complex carbon-based molecule. Both this molecule and its simpler cousin hydrogen cyanide (HCN) were found in the cold outer reaches of the star's newly formed disk, in a region that astronomers believe is analogous to our own Kuiper Belt - the realm of icy planetesimals and comets beyond Neptune. Scientists understand that comets retain a pristine record of the early chemistry of our solar system, from the period of planet formation. As the planets evolved, it's believed that comets and asteroids from the outer solar system seeded the young Earth with water and organic molecules, helping set the stage for life to eventually emerge. "Studies of comets and asteroids show that the solar nebula that spawned our Sun and planets was rich in water and complex organic compounds," noted Karin Oberg, an astronomer with the Harvard-Smithsonian Center for Astrophysics (CfA), and lead author on a paper published in the journal Nature. "We now have evidence that this same chemistry exists elsewhere in the universe, in regions that could form solar systems not unlike our own." This is particularly intriguing, Oberg notes, since the molecules found in MWC 480 are also found in similar concentrations in our own solar system's comets. 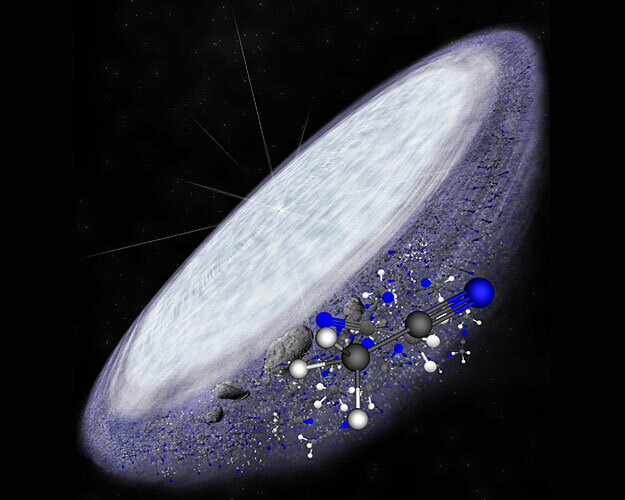 Astronomers have known that cold, dark interstellar clouds are very efficient factories of complex organic molecules - including a group of molecules know as cyanides. Cyanides, and most especially methyl cyanide, are important because they contain carbon-nitrogen bonds, which are essential for the formation of amino acids, the foundation of proteins. "From the study of exoplanets, we know our solar system isn't unique in having rocky planets and an abundance of water," concluded Oberg. "Now we know we're not unique in organic chemistry. Once more, we have learned that we're not special. From a life in the universe point of view, this is great news." This release is being issued jointly by the National Radio Astronomy Observatory and the Harvard-Smithsonian Center for Astrophysics.